Kristine has been designing jewelry and wearable art since 1993. Her designs made their debut at the 51st WorldCon in San Francisco, CA. She sold hundreds of dollars in specialty ear cuffs inspired by the popular Star Trek t.v. show, “Star Trek: Deep Space 9”. Working on designs at the table, people saw what she was doing and would request custom colors & designs. She could barely keep up with the orders, they were coming in so fast! Realizing there was a large audience for such cosplay (“costume play”) accessories, she sold her designs in dealer’s rooms at conventions from San Francisco to San Diego. Then she went on to submit her designs, now expanded to accessories (jewelry boxes, hair picks, fans & cosplay masks) in art shows. In 1996 she won “First Place 3D” at the Gallifrey 7 convention in Van Nuys, CA, for her “Snowflake Obisidian” necklace. 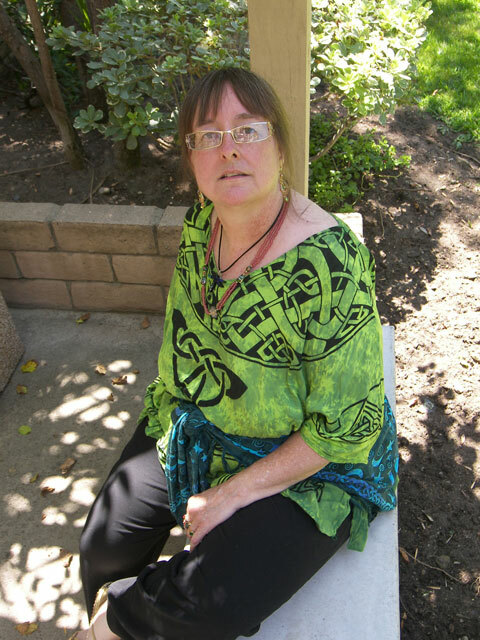 Though she has retired from running tables in dealer’s rooms, Kristine is an art show participant in several local conventions in Southern California. She also has several active storefronts on Etsy.com. Her current lines include ear cuffs and cartilage multi-pierced earrings. An ever-restless creative spirit always has her working on new & unique side projects in various art crafts. They include pentacle hangings, handmade Book of Shadows binders and peyote stitch bracelets. If after viewing her work in the gallery, you would like to commission a custom piece, you can contact her here.